Listening is one of the most loving acts you can do for your child. It confirms that the child is important in your family and in the world. The reward is that your child will keep talking to you, which will be so important in adolescence. The support of a loving parent helps the child make sense of the world. Everyone – parents and children – like to feel that they are listened to and understood. This is vital if they are to have their deep personal needs met, and form harmonious relationships within a family. But there are different ways of listening to your child. Passive listening is saying or doing nothing at all, or making very little comment. It shows acceptance of the child and his/her feelings by being present and interested. Try Passive Listening when you want your child to tell you more. For example, an “Oh, really!” or “And?” will encourage further revelation. Your silence can be very powerful if your child just wants to unload thoughts and feelings. Make sure you have good eye-contact and open body-language. If possible, be on the same physical level as the child, don’t cross your arms, and mirror the emotions of the child. Passive listening allows the child to work through his or her feelings and may help the child come to a conclusion. Active Listening is a wonderful skill to use when you think your child is worried or having trouble with something or someone. So when your child gives off signals that he/she wants to talk to you about a concern or problem, if possible, stop what you are doing and give your full attention in this opportunity for loving and helpful communication. Let your child say what’s on her mind in her own words, in her own time. Say back to your child what you think she is trying to express. If you’re wrong, she’ll quickly let you know. Try to get to the feeling the child is expressing. Her body language will be a clue here. Use the language of acceptance – don’t include judgmental words. Resist the urge to jump in with your solution if the child has a problem. Children often find their own solutions when an attentive parent acts as a sounding-board. Sometimes all the child needs is to be heard, to get it off her chest. The child will be more receptive to your helpful suggestions if you first ask if she wants your help. If there is a problem and your child is willing to enlist your help to solve it, make a time to brainstorm some solutions together, if you can’t do it on the spot. The child’s ability to problem-solve independently can be encouraged using these listening skills. 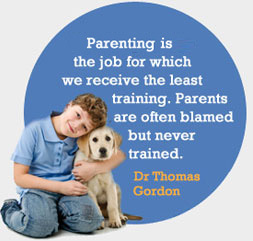 These listening skills are part of the Parent Effectiveness Training course, as developed by Dr. Thomas Gordon.